The UK risks losing jobs and investment without an urgent Brexit transition deal, Britain's five biggest business lobby groups have warned. In a joint letter being sent to Brexit Secretary David Davis, the groups including the CBI and Institute of Directors, say time is running out. The head of the CBI said firms wanted an agreement on the transition period by the end of the year. The other lobby groups backing the letter are the British Chambers of Commerce, the Federation of Small Businesses, and the EEF manufacturers' body. CBI director-general Carolyn Fairbairn told the BBC: "One of the big messages from firms is 'get on with it' on both sides. "This is real, this is urgent and a transition agreement by the end of the year would help enormously to keep investment and jobs in the country," she said. Theresa May has suggested a transition period of about two years, with the UK and EU trading on broadly similar terms to now and payments to Brussels to meet Britain's budget commitments. The five business bodies - which together represent firms employing millions of people - are calling for more urgency, with less than a year and a half left until the UK leaves the European Union. And in a survey released on Monday, the EEF said that Brexit uncertainty was holding back the plans of manufacturing firms to invest in new plants and machinery. 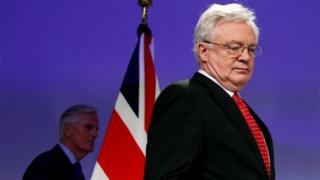 Mr Davis is holding Brexit talks in Paris on Monday after France appeared to emerge as the most hardline EU member state when it comes to the divorce bill. The prime minister is also due to update the Commons on the progress made during last week's summit of EU leaders in Brussels. A spokesman for the Department for Exiting the European Union said the prime minister proposed a strictly time-limited implementation period in her Florence speech.